You'll be £14.99 closer to your next £10.00 credit when you purchase Adolf Hitler. What's this? One of the most intriguing mysteries about the rise of history’s most despised dictator is just how utterly ordinary he once seemed. A chubby child, a mummy’s boy, a failed artist, a face in the crowd… the early images of Adolf Hitler give no hint of the demonic spirit that consumed him. Only later in his tortured life came the metamorphosis, and the mask fell away to reveal the manic monster lurking beneath. The aim of this book is to trace this dramatic process in photographs – some iconic, some rare and intimate – covering the life of a man whose destructive legacy still touches us today. The images, many from the author’s own historic collection, demonstrate the mesmerising power that Hitler wielded not only over the German public but also statesmen, industrialists and global media. For the captions to many of the original photographs are reverential in their descriptions of ‘Herr Hitler the German Chancellor’, the person Time magazine chose as its ‘1938 Man of the Year’. The fascination with the cataclysmic events he caused – involving 61 countries, three-quarters of the world’s population and more than 50 million dead – remains as strong as ever today. The mystery of how one man could exert so much power that he was able to plunge the whole world into war remains unanswered. 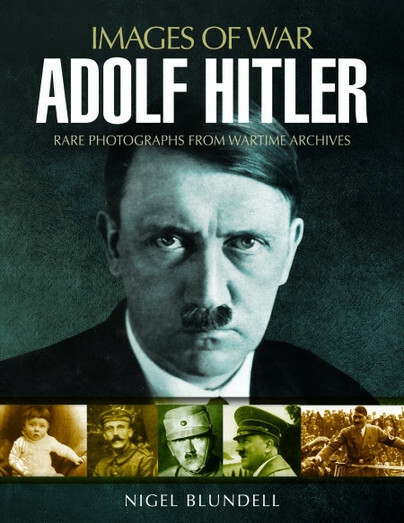 But the subtly changing images of Adolf Hitler, portrayed in this book from pampered baby to bar-room rabble-rouser to ranting megalomaniac, provide a graphic insight into the mind of a monster and the instigator of history’s bloodiest conflict. Nigel Blundell is a journalist who has worked in Australia, the United States and Britain. He spent 25 years in Fleet Street before becoming an author and contributor to national newspapers. He has written more than 40 books, including best-sellers on crime and royalty. He co-wrote the Top Ten exposé Fall of the House of Windsor, which first revealed the so-called ‘Squidgygate’ tape and the infidelity of both Princess Diana and Prince Charles. His other factual subjects have included military history, celebrity scandals, and ghosts and the paranormal.